Fairfax County Department of Transportation officials were at South Lakes High School on Monday to give a progress report on the planned extension of Soapstone Drive. The Soapstone Connector will provide an additional overpass of the Dulles Toll Road with the goal of easing traffic on south Reston roads, particularly in the area of the Wiehle-Reston East Metro station. Just don’t look for it to be built any time soon. 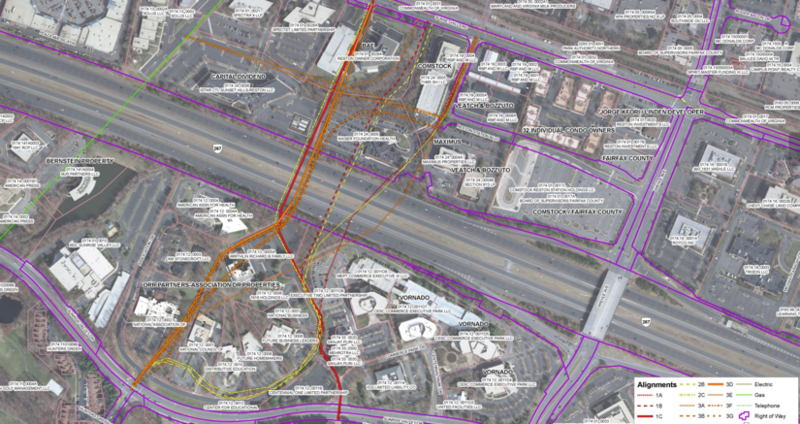 While a feasibility study was conducted in 2013 and the Fairfax County Board of Supervisors approved a hybrid design from among several options in April of 2014, no funding has been designated. FCDOT’s Audra Bandy also said the project needs to go through the environmental review process, which will take about a year. That will include looking at land use, community impact, traffic, safety, noise, water quality and other environmental factors over the next 12 months. Some of the most critical needs: alleviating bottlenecks along Wiehle Avenue at Sunset Hills Road and Sunrise Valley Drive; providing direct access for buses across the Dulles Corridor and to Wiehle-Reston East without requiring travel on Wiehle Avenue; and offering improved connectivity for pedestrians and bicyclists to the Metro station from points north and south of the Toll Road. In 2014, the supervisors included $2.5 million for the preliminary design of this project as part of its Six Year Transportation Project Priorities. At that time, they also put the project — estimated to cost $91.75 million — on the county’s list of high-priority projects for 2015-20. An exact price tag won’t be known until the connector is farther along. According to the preliminary plans, the road, which will have three lanes approaching the bridge and four lanes on the bridge, will require demolition of several office buildings on Association Drive. Bandy said that cost will not be assessed until after Fall 2016. Several area residents attending Monday’s meeting had concerns about the project. Among the questions — why was the environmental study not done prior to the feasibility study. Presently, the impact is only being studied in the immediate area of where the connector will be built. But the study will expand depending on which factor is being studied, officials said. Residents also pointed out concerns with traffic flow, particularly on Soapstone, and lack of connectivity with the W&OD Trail.